Suddenly and in darkness, an immense white flag unfurled, traveled down the side of the stadium, and passed over the heads of the athletes and delegates standing in the center. Once all were safely ensconced under its protective shield, a single dove holding an olive branch in her beak appeared on the white expanse. The dove and the olive branch, symbols of peace and reconciliation were not the only symbols projected here. The five Olympic rings, representing the Americas, Asia, Australia, Africa, and Europe, likewise spread over the heads of the Olympian field. These rings, interlocking and overlapping, symbolize a world of peaceful, supportive unity. In a world still ravaged by war, by racism, by poverty, can we realistically continue to hope for unity? As I watched the opening ceremonies broadcasted from the Olympic Stadium in Sydney last year, I asked myself that question, and what I decided was the following: if we analyze the less overt symbols, those more subtle than a dove, an olive branch, five clustered rings, those subtle symbols of change, then I believe the answer is an unequivocal, courageous, and resounding "yes." After years of tumult, torture, war, of scouring the DMZ, of blood and sorrow, North Korea and South Korea were able to lay their differences aside long enough to march into the stadium together during the parade of nations. A representative of each country proudly shared the flag - four hands waving it to the cheering crowd. Interestingly, one representative was a man and one a woman further symbolizing the reunification of disparate factions. This moment was not the only one in which women were recognized. All the final torch bearers, the ones who passed the torch within the stadium itself, were celebrated Olympic athletes, and all of them (are you ready for this? )...all of them were women. With this move, the Australian organizers recognized women's contributions to and excellence in athletics. I was particularly thrilled to see this moment after recently listening to a drunk man at a Dodger game slur that the WNBA is boring and, therefore, must be banned. 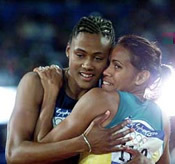 Finally, as the torch was passed on its last leg, it was passed into the hands of Australian runner Cathy Freeman. Much like America's dissension between Native Americans and the white intruder, Australia has a long history of turmoil between the Aborigines and their white population. Freeman, an Aborigine who has succeeded in the white world through her success as a runner, has done much to heal the tensions and bridge the distance between the two groups. As she took the torch, carried it up the white steps, and lit the cauldron, I thought back to a scene in the earlier musical production when little Nikki Webster and a painted Aborigine stood on top of a set designer's pyramid and held hands. Shakespeare once described peace as "naked, poor, and mangled." If the opening ceremonies in Australia last year showed us anything of truth, I would say peace has recently received an endowment to buy a new wardrobe and take advantage of the newest techniques in plastic surgery.